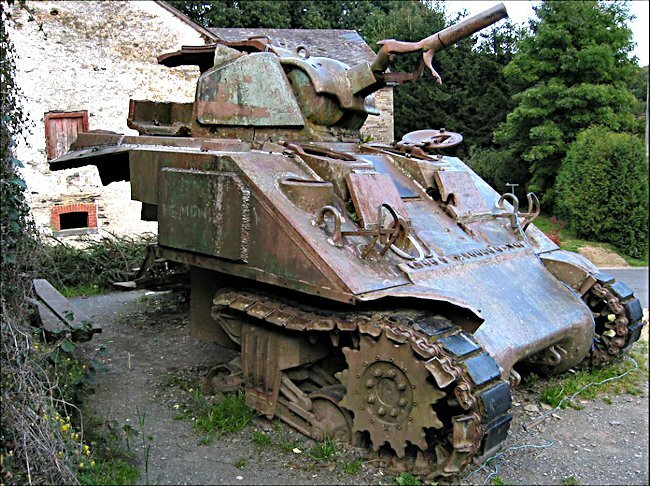 This Surviving M4(75) Sherman Tank took part in the 1944 WW2 Battle of the Bulge in the Belgium Ardennes. 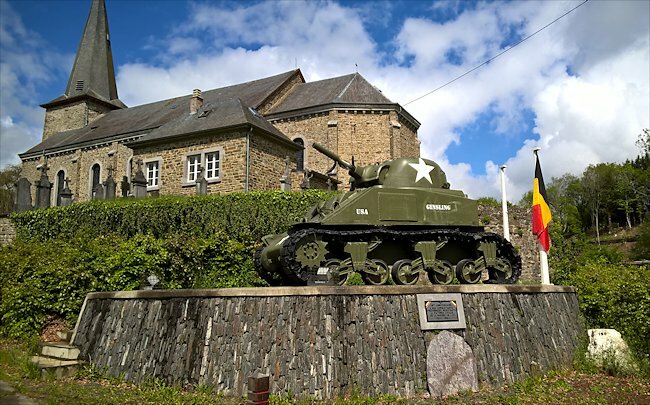 It has been preserved and can be seen at in the village of Wibrin about 15 km north west of Houffalize at the junction of the Rue du Tilleul and Rue du Bourg. Depending on what language you speak the village is called Wilbrin or Wibrin. 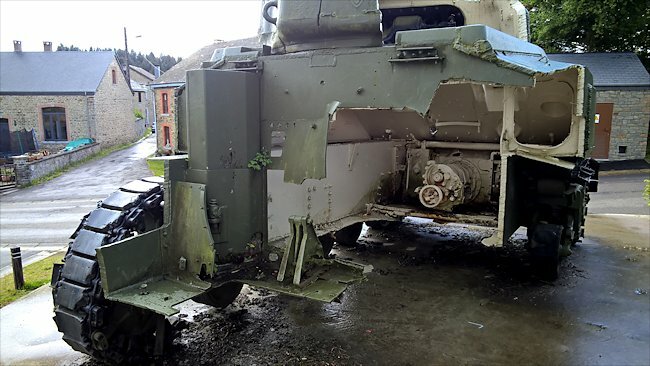 Preserved Wilbrin M4(75) Sherman Tank with missing rear section thanks to the scrap metal merchants. How was the Wilbrin M4(75) Sherman Destroyed? On the 16th December 1944 in bad winter weather the Germans launched an offensive against the American troops resting in the Ardennes. it will become known as the Battle of the Bulge. The final objective was to capture the port of Antwerp and all the allied supplies. First the newly formed German 6th Army had to capture the bridges over the Meuse River. German tank crew member Pfc Hans Herost of the 116th Panzer Division remembers contact with the enemy’s M4 Sherman tanks near the village of Wilbrin. "We did not take the streets, but drove across the fields and meadows because of all the mines. We were on the hill about 1,000 metres way from the village church. From up there we saw the Sherman tank that is now the war memorial in Wilbrin. It was in the same place on that day." "This tank with its small gun was barely a threat to us. Jokingly we just called it a knocking device. The Panther tank that was next to me shot. The shell hit the sloping front armour and bounced off. You can still see the deep gouge on the front. It bounced upwards and hit the Sheman's gun damaging it. When the American crew fired the tube burst. You can see the damage it caused today. 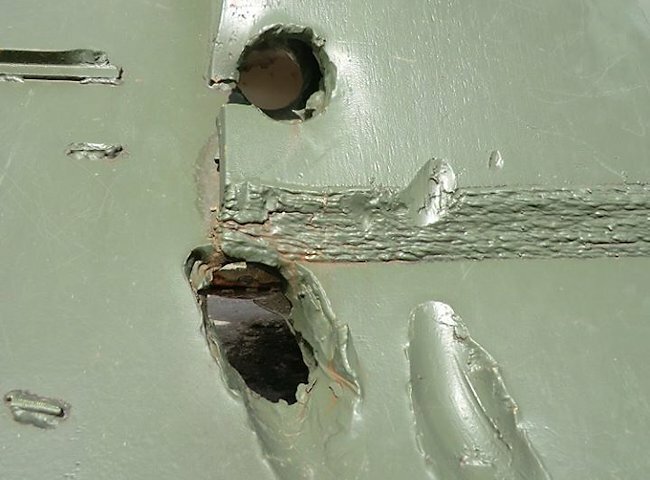 The second shell hit the big bolts on the bottom of the front armour and again bounced off. The third hit went through the armour and it caught fire. We proceeded with our advance." 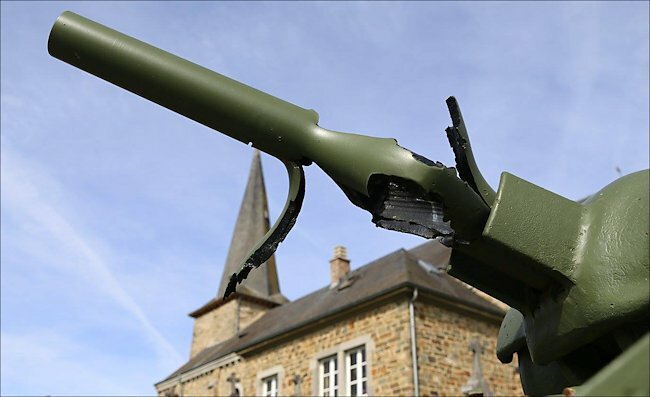 The local priest saved the tank from scrap metal merchants who had already cut away some of the rear and right side of the tank. It was decided to make it the villages war memorial. In 2011 its rust was treated and painted whilst a new raised plinth was built. If you visit the Wibrin Sherman make sure you call in and have a beer at the cafe called Le Vieux Wibrin a 200m further east along the main road. It is very pleasant to sit inside on a cold day or outside on a sunny day. They have a lot of veterans visit. The tank has a late model 75mm barrel that was probably replaced in 1944. 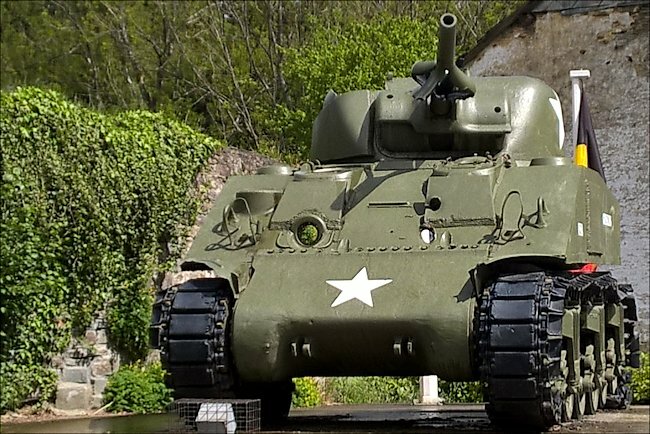 It is believed that the tank belonged to the 84th Infantry Division of the US 42nd Armored Division. Some sources say it was knocked out on 14th January 1945. What is very interesting is that the additional welded spaced armour in front of the driver's position did not stop the Panther tank's 75mm round. It went straight through the plate and the hull armour. The information sign inside the turret is wrong. It is not a M4A3 Sherman. It is a late production M4. This photo was taken inside the tank by the driver's position. As you can see the 75mm German shell went straight through both pieces of tank armour and entered the interior. The driver would have died instantly. 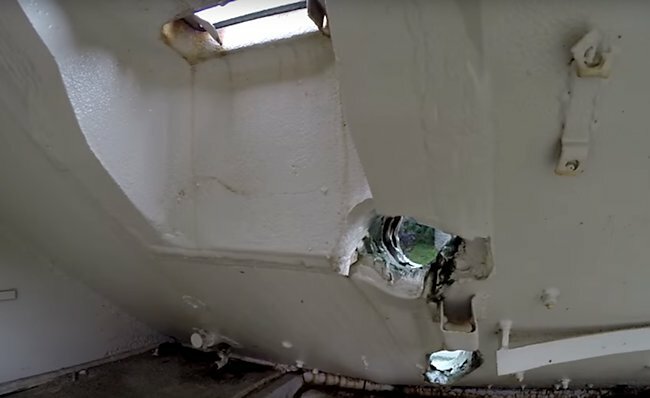 A second shell also entered the tank via a shot to the front hull just under the first. A third bounced off the armour plating but made a deep gouge. At night, during the battle of the Bulge, the infantry would set light to a nearby shed, hay-barn or abandoned house. The light it gave off would mean that any advancing Germans would and expose themselves and could be picked off while they're highlighted. It was a necessary safety measure. This one night our five Sherman tanks were camped up with the infantry on a road near a field between some woods. The hut that had been set on fire was further up the road. The road was a gentle rise and an infantry guy came running toward us. He said there's a halftrack coming. So we thought, 'Halftrack, boy oh boy! Where is she?' Big Andy was my driver. He eased the tank back off of the road. Ted Duskin was my gunner. He swings the gun out and lays it up the road. And through this smoky haze that the fire is making, here comes this Germans, but it ain't no halftrack. It's one of the big tanks, a Panther. I just remember thinking, 'God, this is gonna hurt.' Ted shot immediately as that bulk came through the haze and he must have hit the turret; there was a big shower of sparks. They were heavily armored in the front and they were only really vulnerable in the rear. There is a lot missing from the rear of the Wibrin M4(75) Sherman Tank. It was cut away by scrap metal merchants before they were stopped by the local priest. About a second after we fired, he fired. A big lick of flame came out of the muzzle of the gun and it hit our Sherman. It seemed to hit it down low in the carriage and made a hell of a sound. And suddenly, the German began to move backwards into the smoke. How lucky can you be? He could have easily taken us all out. Our Sherman's only had the standard 75mm guns and they were no match for a Panther coming straight at you. The shells would just bounce off. I think that light from the fire blinded him. His night vision would be poor. That tank commander must have thought he had stumbled into a carefully planned ambush and not knowing what he was up against in the dark, decided to retreat. We quickly took a look at our tank and one of the bogey wheels appeared to be almost severed, He hit us down low. It glanced off fortunately for us. And with the track still intact, Andy could ease her back. We eased her back down the slope and that German tank didn't come after us. But talk about being scared. We were so lucky. This is what the Wilbrin M4(75) Sherman Tank looked like before it was had its rust treated, bodywork painted and placed on a new plinth.